What is vertical talus? Vertical talus is also known as congenital rigid rocker bottom foot or congenital convex pes planus. Congenital case of vertical talus is not a common disorder. It is a rigid flat foot which required early identification and treatment. It is unilateral or bilateral and in certain cases, vertical talus is an adaptive changes due to dislocation of the talonavicular joint. The deformity begins during in utero period. However, it may be detected anywhere between infancy to adulthood. Vertical talus is classified as isolated case of vertical talus or syndrome related vertical talus. The incidence vertical talus ( as a stand alone ) is rare. Vertical talus has an association with other anomalies and disorders. Vertical talus is associated with trisomy 13,15,18, Lorsen syndrome and arthrogryposis. Congenital vertical talus present in children who suffer from myelodysplasia ( 10% of cases) . It affect female and male equally with 20%-40% of cases occur as an isolated anomaly ( 1,2). Myelomeningocele is also associated with vertical talus. 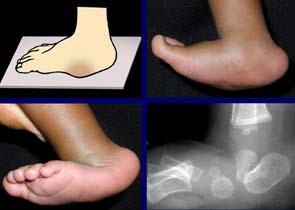 Arthrogryposis multiplex, are among the risk factors of developing vertical talus. In some genetical studies, it is reveals that there is a vertical transmission with incomplete penetrance ( autosomal dominant). In term of pathophysiology, there is an imbalance of the muscle between the dorsiflexor muscle of the forefoot and plantarflexor muscles of the hindfoot which leads to a disruption of the talonavicular joint ( middle of the foot). Patient who suffer from vertical talus may also complain of lack of push off strength and if untrerated by walking afe may present with callus under the head of the talus. On examination , there will be a moderate reversal of the arch and formation of a crease ( near the sinus torsi) on the dorsum. On examining the patient, always check the spine and other extremities for any abnormalities. The strength and power of both lower extremities should also be assessed. Asked the child to wait and observe the gait and the foot in stance. Vertical talus is presented with convex sole of the foot which is rigid and has a rocker bottom. The child has a tight achilles tendon and the heel is in a fixed equinus. It is easy to palpate the head of the talus . The head of talus is palpable on the medial side in the sole of the foot. The hindfoot is in a valgus position while the forefoot is in a dorsiflexing of the midtarsal joint and abudcted. The appearance of the foot become more distinctive as the child getting older. Vertical talus will produce a plantar prominence and a dorsal crease. Radiography plays an important roles in detecting vertical talus . On radiography image, the talus is angled medially on the AP films while on lateral film the talus is plantarflexed. The navicular is perched on the neck of the talus and dorsally dislocated.The forefoot is abducted and displaced dorsally. The calcaneus is in a fixed equinus condition. In the worst case scenario, the talus is parallel to the tibia and only the most posterior aspect of the talus that appear to be articulate with the tibia. The diagnosis of vertical talus is confirmed by obtaining the extreme plantarflexed view. In this view, the line through the talar axis pass plantar to the axis of the metatarsal and the navicular is not reduced. The pathological finding reveals that the talus is plantarflexed , medially angle and hypoplastic . The calcaneus is laterally displaced and in equinus. Posterior contraction of Achilles tendon is observed. Contraction of tibialis anterior and toe extensor is seen. The differential diagnosis of vertical talus are flexible flatfoot and calcaneovalgus foot. What is the treatment of vertical valgus? Surgery is the main treatment option. However, soft tissue need to be stretch pre- operatively by casting and manipulation. Surgical intervention is preferred if the vertical talus is recognized in the patient less than 2 years of age. The surgical procedure involves closed or open reduction and pinning of the talonavicular joint.The new accepted technique is reduction and percutaneous pin fixation with a tenotomy of the Achilles. The contracted Achilles tendonand anterior tibialis also can be lengthened. There will be a fusion of the in children and stabilization of the medial joint capsule. At postoperative 6 weeks pins of talonavivular joint (percutaneous) is removed. Subtalar joint is considered in case of recurrent deformity or . Salvage is considered ini adults and adolescent which involves removal of large portion of talus and triple atrhodesis. The growth of the foot is monitored throughout childhood .The child is followed periodically to justify the normal growth.Any untreated condition may lead to progressive disability,poor push- off, breakdown of the skin and callus are the complications of non treatment. The complication of treatment are residual valgus or varus, stiffness and need for additional srugery. Parent and patient should be informed about the chances of inheritance of the future offspring as well as the need for additional surgery and risk of developing hip dysplasia. Vertical talus doesn't resolves spontaneously.